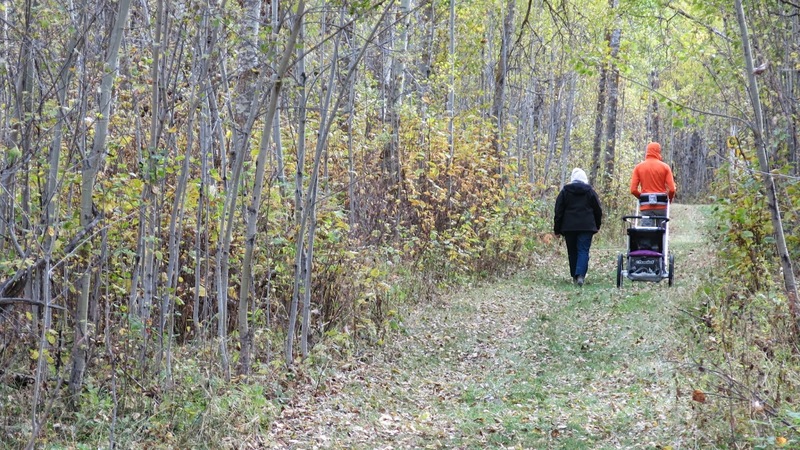 We found ourselves walking along the paths of Elk Island National Park today – about a 4 km hike back to one of the lacks and right by a couple of rather large bison to a wonderful lunch of dill pickle soup, fresh bread and many types of fruits and nuts. Our soup was heated over an open fire and I have to say after the hike and with all the fresh air it was delicious. Phil has always loved the outdoors and with Amanda they spend a great deal of time enjoying this province and the many types of terrain that it offers. They have purchased for Carlyle a chariot….a stroller unlike many others…it has a lovely harness that lets it be pulled by a harness and with it’s large tires the terrain doesn’t matter much. We had a great time watching little Carlyle bounce along inside it completely protected by a screen and, when needed, a clear vinyl cover. The few days we have had to enjoy our time here have not limited our ability to enjoy Carlyle, now 7.5 months, and to see how she has developed since our last visit when she was 7 weeks. Tomorrow we head home in time for a busy week and more adventures even if they are more local ones.